It’s finally here! 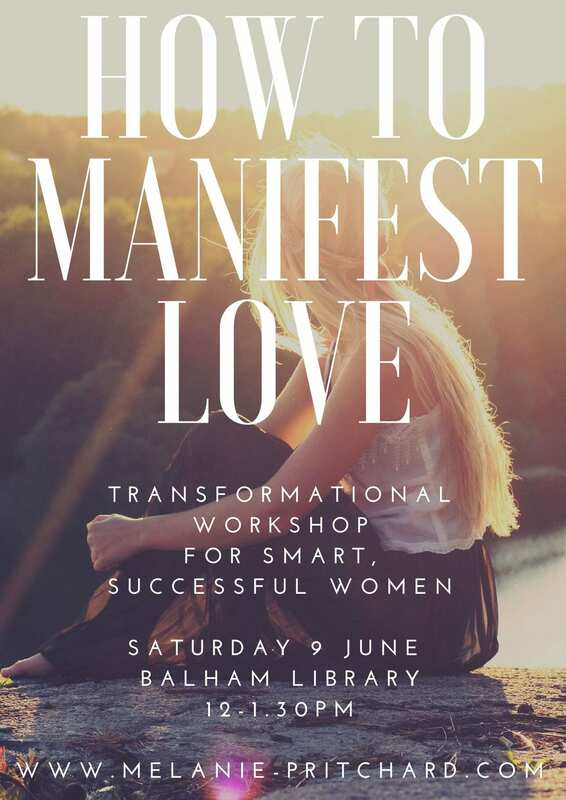 My “How To Manifest Love” workshop for smart, successful women is landing in London on Saturday 9 June 2018, 12 – 1.30pm in the cosy Balham Library – and I guarantee it will leave you on a high. Never has manifesting love felt more important, in an age swamped by possibility and pressure in equal measure. The stress and overwhelm that comes with dating apps, the difficulty of juggling freedom with the ticking biological clock and social media ‘perfection’ hitting us left right and centre. This is why I’m more excited than ever about this transformative workshop – because no matter how strong, smart or successful we are, managing the above can be damn hard. And with our ‘always on’ culture reaching almost volcanic intensity, the time has never been more ripe for carving out some time to discover a toolkit for expediting love. * You want a tried and tested magic method which bypasses dating App disillusion and actually works. *Why gratitude is so important in the game of love. If that’s you or one of your friends, please send them this link because this slice of time-out and tune-in may just change their life. And that’s a money-back promise. And if you think this is too good to be true, think again. I know this toolkit works because it’s worked for every person who’s truly engaged with the process. Including me. If you join us on 9 June, be prepared to leave a different woman… because when you think and feel what you want on the inside, the universe conspires to bring you exactly what you want. Sometimes we just need a little help getting there. “Mel’s relationship coaching has been transformative. After years of heartache, I’ve finally learnt how to manifest my dream man and I think he has just showed up! Her warmth and empathy really put you at ease as she guides you to identify blocks that are keeping you stuck, what you want in your dream mate and how you want to feel. She also teaches you the tools to make those dreams a reality, from affirmations, reframing + NLP visualizations to simple exercises + book recommends which help you master your mind and reprogram your sub-conscious. I’ve loved working with her and guarantee you’ll leave her workshop feeling inspired, energised and ready to attract what you want”.